RAW POLITICAL POWER…and its consequences. Raw political power are the privies of despot, tyrants, dictators and those in government. The use of it can be explained to others in a variety of ways….from maintaining national security to anything that those in political power would care to use in making right what they know is wrong. In Malaysia my first inkling of the power vested in Federal government came after the May 13 racial riots. Umno took absolute control of all facets of government and then proceed to implement whatever policy they deem fit to ensure that the Malaysia that Umno wants, came into being. After May 13, there were a number of notable actions by the Umno led Barisan Nasional government that left no doubt in my mind that Umno intended to use political power to achieve their political agenda and cover their vested interest to the exclusion of any other considerations. Memali, Ops Lalang, the use of the ISA, OSA and similar legal instruments to advance their own political agendas….and of course, that most previous of all wounds to many of us, the prosecution and persecution of Anwar Ibrahim. In all these instances, if you are in government as Umno then was, raw political power was used for Umno ends. For Umno the ends justifies the means. We know now what all this use of raw political power has resulted in the Malaysia of today. The very same one we are now living in. One one side we have Umno and a president/prime minister with political power to do exactly as he please towards any end he cares to choose. And in this endeavour he heads a government totally complicit to the ends that he wants to achieve. And this has been achieved judiciously by a prime minster who tells all who will listen to him….THAT CASH IS KING. On the other side is Pakatan Harapan led by Tun Dr Mahathir. Tun Mahathir’s past mirrors that of Umno. The rise and rise of Tun Mahathir and Umno was a blend of raw political power used to meet the personal needs of individuals and the national demands of a multi racial nation. Now Tun Dr Mahathir, for whatever reason, has taken it upon himself to lead the opposition against Najib and Umno. What Tun Mahathir no longer has is that raw political power he once wielded so effectively in his relentless pursuit of his own ends. I shall not go into what Tun Mahathir’s ends are…he can do so himself more effectively….but we know this. The use of raw political power always has its consequences simply because raw political power is not yours to have forever. And when you lose it, it comes back to seek you out with a vengeance…and for most times, are punitive in nature. This was what happened yesterday when Tun Dr Mahathir was refused permission to see Anwar Ibrahim. This was Najib Razak flexing his political muscles to show Tun Dr Mahathir and anyone else watching….I AM IN CHARGE! And Najib Razak is in charge…for now. 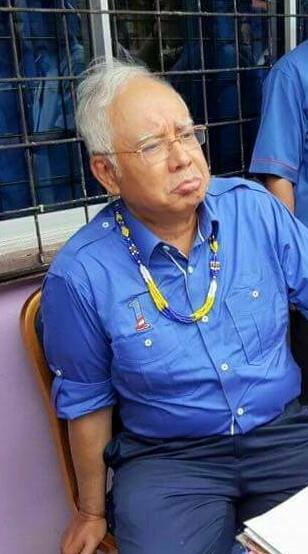 The question that needs to be asked of Najib Razak is this : Did you even stop to consider the consequences of your actions? Did you not understand that this morning….millions upon millions of Malaysians in Bolehland, UK, Europe, the US…and yes even in Melbourne….we are all trying to work out in our heads how anybody in government can that stupid of an idiot to stop Mahathir from visiting Anwar Ibrahim in hospital? I woke up this morning with one phrase in my mind…”RAW POLITICAL POWER”. I asked myself when will these political bastards understand that today, everything they do will be talked about, discussed, debated and pull apart over and over again by anyone who cares to do so…and all this can be done in real time. I choose to sleep over it and then write about it early this morning so that it can be in steadyaku47 and my Facebook, in time for many of you to read over breakfast….and then have your say as to whether you agree or not to my take on the situation. I just want this Mr Idiot to ponder on this : How many Malaysian do you think you have pushed onto the side of Pakatan Harapan and Tun Mahathir by this utterly stupid and inane decision you made in not allowing Mahathir to visit Anwar in hospital? Did the Idiot say that the Law does not permit Mahathir to visit Anwar Ibrahim in hospital? I only have this to say to that….try being gracious…try being compassionate…try being respectful to the wishes of a 91 year old man who has had so much to do with your political ascent to where you are now….and most important of all…try common sense. But really the damage has been done. Another nail hammered into this idiot’s coffin… another day closer to the idiot political demise…..and Dear God…please hasten this idiot end. If you will not do it for us, GOD…then do it for the Idiot because we can see how much the Idiot is suffering. Even animals who are suffering without hope of being revived or cured are kindly put to sleep….why not this IDIOT? Put him out of his misery please GOD! By Hussein Abdul Hamid|2018-07-14T05:44:08+08:00January 10th, 2018|Categories: Uncategorized|Tags: Anwar Ibrahim, Mahathir, Najib, raw political power|Comments Off on RAW POLITICAL POWER…and its consequences.